Homeland Security (HS) is a concerted national effort to prevent terrorist attacks within the US; reduce domestic vulnerability to terrorism, major disasters, and other emergencies; and minimize the damage and recover from attacks, major disasters, and other emergencies that occur. HS is typically conducted by federal, state, tribal, and/or local government organizations in conjunction with the private sector; and includes law enforcement (LE) activities related to countering terrorism and other criminal activities. For HS, DOD may conduct DSCA in response to requests for assistance from civil authorities, supporting a lead interagency partner such as DHS or Department of Justice (DOJ), or in some cases, a state governor. DOD support must be formally requested by the applicable civil authority and then approved by the President or Secretary of Defense (SecDef). The Department of Homeland Security (DHS) is the lead federal agency for homeland security. Homeland Defense (HD) is the protection of US sovereignty, territory, domestic population, and critical infrastructure against external threats and aggression, or other threats as directed by the President. An external threat or aggression is an action, incident, or circumstance that originates from outside the boundaries of the homeland. Threats planned, prompted, promoted, caused, or executed by external actors may develop or take place inside the boundaries of the homeland. The reference to external threats does not limit where or how attacks may be planned and executed. DOD is responsible for the HD mission, and leads the response with support from international partners and United States Government (USG) departments and agencies. HD is executed across the active, layered defense construct composed of the forward regions, the approaches, and the homeland. Homeland Defense (HD) is a Department of Defense (DOD) mission. DOD is the USG lead agency responsible for defending against traditional external threats or aggression (e.g., nation-state conventional force or weapons of mass destruction [WMD]) attack and against external asymmetric threats. During HD operations, DOD coordinates with other interagency partners that may be undertaking simultaneous operations to counter the same or other threats. Homeland Defense (HD), DSCA, and homeland security (HS) operations or events may occur simultaneously. Perhaps one of the greatest challenges for a military staff is operating in or near the homeland and being subject to the inherent legal and jurisdictional responsibilities that accompany such operations. This challenge is set against the evolving range of threats to the homeland–to countering transnational organizations and individual actors of concern internal and external to the US. HD and DSCA missions can be conducted in a simultaneous, near-simultaneous, or sequential fashion, across the threat spectrum, within or near the homeland. A full range of threats and hazards confronts the homeland. Many threats may not require a DOD-led response, and may not require a response from more than one civilian department or agency. The characterization of a particular threat, and the designated response agencies and modes, ultimately rests with the President. To prepare for wide-ranging contingencies, the USG has developed specific protocols and response options that address the coordination, integration, and responsibilities of the federal agencies to respond to the full spectrum of threats and hazards. Codification of these strategies, processes, and procedures is found in documents such as the National Strategy for Maritime Security and US Aviation Security Policy, and their respective supporting plans. These types of processes aid both the military and civil authorities to identify which agency or agencies are best suited to achieve the USG’s desired outcome given the unique circumstances of the event. Homeland Security is a concerted national effort to prevent terrorist attacks within the US; reduce America’s vulnerability to terrorism, major disasters, and other emergencies; and minimize the damage and recover from attacks, major disasters, and other emergencies that occur. Homeland Defense is the protection of US sovereignty, territory, domestic population, and critical infrastructure against external threats and aggression, or other threats as directed by the President. Defense Support of Civil Authorities (DSCA) is support provided in response to requests for assistance from civil authorities for domestic emergencies, law enforcement support, and other domestic activities, or from qualifying entities for special events. HS is a concerted national effort to prevent terrorist attacks within the US; reduce America’s vulnerability to terrorism, major disasters, and other emergencies; and minimize the damage and recover from attacks, major disasters, and other emergencies that occur. DOD is a key part of HS, conducting HD and DSCA. DHS will usually be the federal agency with lead responsibility, and will be supported by other USG departments and agencies when requested. DOJ has lead responsibility for criminal investigations of terrorist acts or terrorist threats by individuals or groups inside the United State, or directed at US citizens or institutions abroad, where such acts are within federal criminal jurisdiction of the US, as well as for the related intelligence collection activities within the US, subject to the National Security Act of 1947 and other applicable law. The National Strategy for HS addresses the terrorist threat and provides a comprehensive framework for organizing the efforts of federal, state, local, tribal, and private organizations whose primary functions are often unrelated to national security. HD efforts often complement HS efforts and the reverse is also true. DOD protects the homeland through two distinct but interrelated missions, HD and DSCA. DOD is the federal agency with lead responsibility for HD, which may be executed by DOD alone (e.g., BMD) or include support from other USG departments and agencies. DOD’s role in the DSCA mission consists of support to US civil authorities (DHS or other department or agency) for domestic emergencies and for designated LE and other activities. While these missions are distinct, some department roles and responsibilities overlap and operations require extensive coordination between lead and supporting agencies. 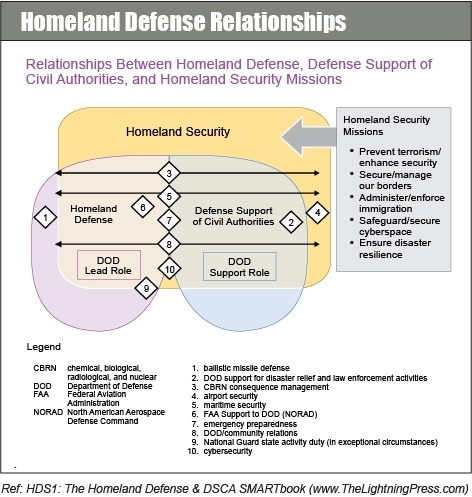 Figure A-1 illustrates a notional relationship between HD, DSCA, and HS lead and supporting relationships and provides examples of the types of operations that can take place for each mission. HD and DSCA operations may occur in parallel and require extensive integration and synchronization. Understanding the roles and responsibilities of AC and RC forces and how they are used and the various duty statuses used to employ NG forces (Title 10 and Title 32, USC, and state active duty), is critical to achieve integration and synchronization. Read more about Homeland Defense (HD), Homeland Security (HS), and Defense Support of Civil Authorities (DSCA) in “HDS1: The Homeland Defense & DSCA SMARTbook (Protecting the Homeland / Defense Support to Civil Authority)” by The Lightning Press. Download a free PDF sample and learn more at: “HDS1: The Homeland Defense & DSCA SMARTbook (Protecting the Homeland / Defense Support to Civil Authority)“.